Are You Ready to be Conversational in Spanish? free trial, then $15 per month! I have so much more clarity on the past tenses. This was a gap in my learning for sure. This course has been very helpful for me. Not a week went by where I wasn't able to apply something new from the previous week. I absolutely LOVE your podcast and write-ups that go with them. Exactly what I have been looking for to further my Spanish! By far the best presentation I've seen on the past simple vs past imperfect, and I've been studying Spanish for ten years! Prior to this course, I was sort of cruising, thinking I would learn by osmosis! How wrong that was! I’m so glad I signed up for this class. I am delighted with the progress I have made in my Spanish with this class! It has “set me free” in so many ways. WHAT IS THE REAL FAST SPANISH SCHOOL? The Real Fast Spanish School is an online membership dedicated to helping your improve your Spanish in a simple systematic way. Each course inside the school is designed to help you with a specific component of your Spanish skills. There are courses dedicated to vocabulary fundamentals, listening comprehension, grammar, study habits and improving your mindset for learning a language. Most Spanish schools forget that learning a language requires more than just vocabulary and grammar, you also need to develop your motivation, focus, routines and study habits as well as overcoming nerves when it comes to trying your Spanish out in the real word. The Real Fast Spanish School is ideal for beginner to upper intermediate Spanish students who want to know how to effectively improve their Spanish. If you are looking to build confidence with your Spanish and like following a set curriculum then the Real Fast Spanish School is designed to challenge you in a systematic way to take your Spanish skills to the next level. I've been using the Real Fast Spanish School for the last few months and love it! There's loads of content available from the video tutorials to podcast transcripts. The introduction section is done perfectly in small segments so that you don't get overwhelmed and I think the material in the lessons is explained very well. I like the idea of learning the most used phrases/verbs etc. instead of getting bogged down in grammar that I may never use or at least don't need to know straight off. It's a great way to learn Spanish and I think it takes out the daunting aspect of learning a language. Muy bien Andrew! Gracias! What I love about the Real Fast Spanish program is that it focuses on the 20% of the work that will produce 80% of the results. Andrew gives you all the words that you need to know and in his videos he shows you how you can use them in daily situations so you can start to speak Spanish really fast. This is not a normal education program that teaches how to speak a language in a way that makes other people think you have learned it from a book. It gives you the tools you need so that you can actually start speaking and from there on keep on improving. I absolutely LOVE your podcast and write ups that go with them. Exactly what I have looking for to further my Spanish! My wife and I had been doing this program for a week, and our Spanish was poor at best, however, after just 7 days of this program we can now actually hear conversations. We now understand words we should know when we hear them and we are understanding the gist of the conversations going on around us. What was just machine gun Spanish has become understandable conversation. Amazing transformation in just one week. I have really enjoyed the Real Fast Spanish School. I joined mainly to utilise the listening program. It was extremely beneficial to work through listening comprehension each day. It has helped tremendously. While I definitely have a way to go, my ability to understand podcasts, TV shows & movies in Spanish has improved out of sight. WHAT IS INSIDE THE SCHOOL? The Spanish Vocab Grab is a fundamental vocabulary course. The vocabulary taught in the course is chosen for it’s high use in the Spanish language and it’s practically for conversational Spanish. Each day you will get access to a new video. The video will introduce 10 new words and give comprehensive examples of their use. A set of practice questions is available at the end of every video to test your knowledge and to give you confidence the information is sinking in. The Zero To Conversational course is designed to teach an effective process for acquiring Spanish as quickly as possible. In this course you will learn how to improve study habits, overcome road blocks and avoid procrastination. You will learn techniques for memorising vocabulary and hacking the grammar of Spanish. There will be conversion challenges designed to help you to start producing Spanish output. You will learn how to find native spanish students to practice with no matter where you live in the world. You will also learn how to improve your conversational skills. In fact, the skills in this section of the course can be practiced in your first language. Fluent Spanish Listening is a program specifically designed to help improveyour listening comprehension. On each day you will get access to a number of Spanish recordings that include dialogues designed to test and stretch your listening skills. The Spanish dialogues range from 10 seconds in the first module to 10 minutes in the final module. Accompanying the dialogue on each day you will be given a set of practice questions designed to increase your comprehension. When you listen to the audio and then test your understanding through the practice questions you start to actively listening. Active listening is the secret to improving your listening comprehension. A full transcript for each audio and answers to the practice questions will be made available on the following day. There is also daily grammar and vocabulary tips to help prepare you for the recordings in lesson. When you sign up to the Real Fast Spanish School you get access to all of the transcripts of the Spanish conversations from podcast in the episodes with the spanish guests. Whenever a new conversation in Spanish happens on the podcast, the recording will be transcribed and included in the school. 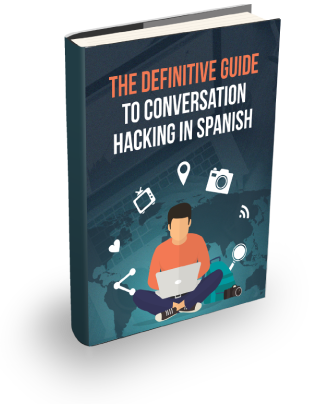 The Spanish conversation will be available and provided with the english translation for you to read along and make sure you don’t miss a single word. Is there a minimum number of months I need to be in the school? No, you can be a member of The School for as little or as long as you like. Will I learn the Spanish of Spain or the Spanish of South America? Our listening comprehension course is recorded with a Mexican Accent. But, we also have podcast interviews with natives from Spain. In general, we teach international Spanish. This means the vocabulary and grammar you will learn in The School will apply to all Spanish-speaking countries. You will typically get a response within 24 hours.